Call boxes on campus don’t work, and that’s unacceptable. One of the most important safety measures, apart from officers and patrolling security guards, has been compromised for several years now, according to Georgia State’s Chief of Police Joseph Spillane. If a student is in need of help immediately, they can totally just push the button on the outdated box. Obviously, it’ll call a Georgia State University Police Department (GSUPD) officer who will be able to respond within 90 seconds. At least that’s what tour guides and orientation leaders say to prospective students. It’s grossly deceitful that representatives of the university must lie constantly because they’re uninformed—or misled—about the boxes’ lack of functionality. As students, our safety shouldn’t be shorted because of budget restrictions. With an $8,000 price tag per box, it’s understandable why GSUPD hasn’t replaced them yet. However, it doesn’t take away from the fact that we’ve been misled. If one of us feels threatened, we’re supposed to run over to the box and request assistance. Instead of running away from a potential perpetrator, a student may run to a call box only to find that the ancient call lines have essentially been cut. We’re given a sense of comfort by the faint blue glow of boxes that appear periodically on our open campus. But now, that sense of comfort has dwindled. We find no solace in the boxes anymore since they don’t provide anymore than a gentle warning to criminals. “You maybe shouldn’t commit a crime here,” the boxes suggest, though their “out of order” signs now say otherwise. 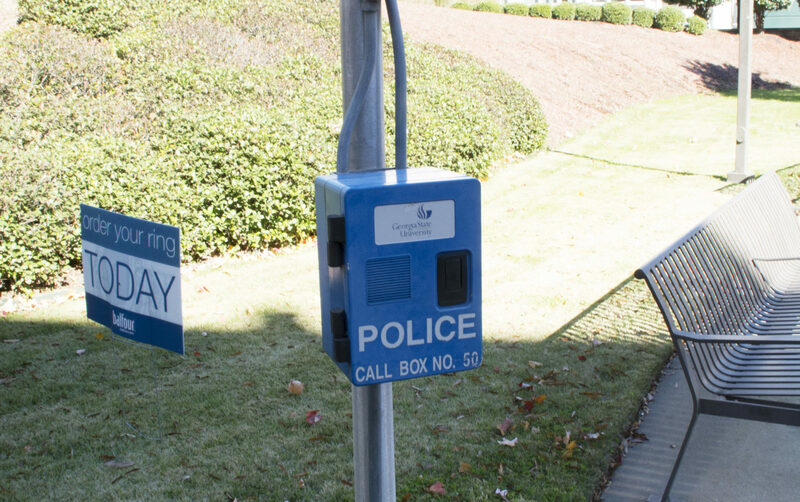 Spillane said in an interview with The Signal that GSUPD plans to replace call boxes in “key locations” that are frequented by students, such as the well-lit Unity Plaza. But this begs the question: Why not prioritize locations that aren’t as frequently traveled by students? A student is probably more likely to be harassed or attacked in a dark, isolated corner of the campus than the bustling courtyard surrounding the Student Center. But the most frustrating thing about all of this is that GSUPD knew about this issue for years and still did nothing to fix it. Sure, we can wait two months until the dispatch center is completed and then the boxes are replaced, but what if there’s an incident between now and then? What if there was an incident in the past that could have been prevented by actually being proactive? The LiveSafe app offers students the ability to directly contact GSUPD. But what happens if there’s a service outage or a student’s phone dies? We’ve all been there when our phone battery depletes after a study binge or night out with our friends. Or if a student’s phone is snatched? The lack of honesty when it involves our well-being is disgusting and students shouldn’t have to be told their safety is prioritized when in reality it’s not. And, of course, we must ask: What else has the university been misleading us about?